To get the calorie count of foods, you can choose from hundreds of websites and dozens of software programs. My company has offered both sources for many years. I'm not here to blow my own horn, though. Instead, I want to describe five features that separate good calorie counters from bad. Shows calorie count of foods! Finding the calorie count of foods shouldn't require you to "drill down" through food categories or worry about spelling. A calorie counter should be able to pounce on any food in less than two seconds, even you misspell it or enter an alternative name ("wiener" or "weiner" instead of "hot dog" or "frankfurter," for example). Similarly, you should be able to choose any serving size—volume or weight, metric of English—without jumping through hoops. Besides revealing calories, a good website or software will show dozens of other nutrients in the foods—fat, trans fat, cholesterol, sodium, calcium, folic acid, antioxidants, and more. The best tools also calculate the number of calories you've burned in exercise, which allow you extra eating. 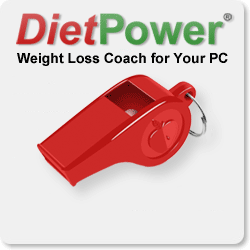 In rare instances (DietPower is one of them), tools that look up the calorie count of foods also monitor your personal calorie needs and give you a calorie budget guaranteed to bring you to a goal weight on a target date. In DietPower's case, the program also reveals which of your favorite foods will most improve your nutrient balance. We know of no other program that does this in real-time, but will post any to which we are alerted.